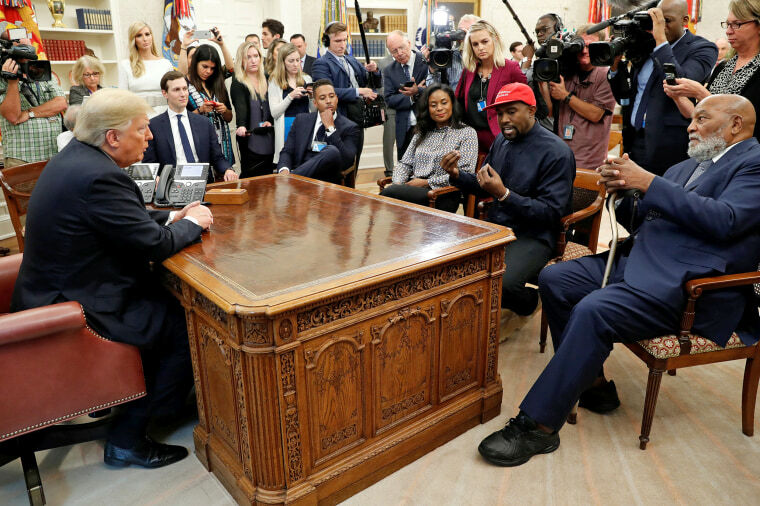 Rapper Kanye West, in an Oval Office meeting on Thursday with President Donald Trump, delivered a rambling speech about his mental health, his family, his business, "the universe" and his fondness for the president. Sporting a red "Make America Great Again" cap, West said Trump made him feel manly, and that's why he supported the Republican businessman over Democrat Hillary Clinton in 2016. "You know they tried to scare me to not wear this hat. My own friends. But this hat, it gives me power in a way," he said, later comparing it to a "Superman cape." West, who was at the White House for a lunch meeting on prison reform, gang violence prevention and other topics, gave extended remarks that lasted nearly 10 minutes, in front of rolling cameras and a trove of reporters. He was seated alongside former NFL star Jim Brown, who was also there to discuss prison reform. West spoke of his family, noting that "my dad and my mom separated so I did not have a lot of male energy in my home and also I married into a family where, you know, there’s not a lot of male energy. It’s beautiful though." He also disclosed that he had been diagnosed with bipolar disorder, but that he felt it was a "misdiagnosis" and that he was simply sleep-deprived. Over the course of his sprawling speech of loosely connected ideas, West also talked about the 13th Amendment, his business partnership with Adidas and whether he would ever run for president. To that, West said: "Let's stop worrying about the future. All we have is today." Trump, he added, "is on his hero's journey." At other points, West touched on issues of race and criminal justice, including policing and other social issues. He said that "stop-and-frisk" policing used in Chicago — a tactic that authorizes police to indiscriminately stop and search any pedestrian for weapons or illegal contraband — "does not help the relationships in the city." "And everyone that knew I was coming here said, 'Ask about stop-and-frisk.' That's the No. 1 thing that we're having this conversation about," West said. Trump has praised stop-and-frisk as a good solution for high-crime neighborhoods in cities like Chicago. Trump responded to West's difference of opinion by saying he was "open-minded." Earlier, West suggested that "welfare" is the reason many African-Americans tend to vote for Democratic candidates. "You know, people expect that if you’re black you have to be a Democrat," West said. "I’ve had conversations that basically said that welfare is the reason a lot of black people end up being Democrats." He also encouraged schools to implement mental health and art programs for children and said violence on the streets is a product of illegal guns, not legal guns. “That was quite something,” Trump said. West has repeatedly expressed support for Trump during his presidency, drawing backlash as a result. West has said that he didn't vote in 2016, but if he had, he would have voted for Trump, and he met with Trump during his presidential transition. Last month, West sported a "Make America Great Again" hat as he delivered an off-air politically themed rant to an uncomfortable audience after the taping of the Sept. 29 season premiere of "Saturday Night Live," which airs on NBC. During the speech, West defended Trump and claimed to be his "real" self, boasting that he had not taken what many presumed to be his psychiatric medication. In May, Trump met with West's wife, Kim Kardashian West, about criminal sentencing reform. During the meeting, Kardashian West pushed Trump to commute the sentence of Alice Marie Johnson, a first-time offender who was sentenced to life in prison in Tennessee in 1996 for her involvement in a drug conspiracy. The president commuted her sentence in June.